New Contest “The big cake” ! 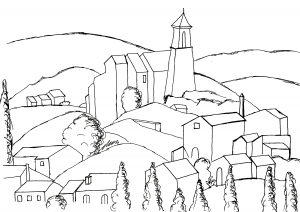 Coloring books to win ! 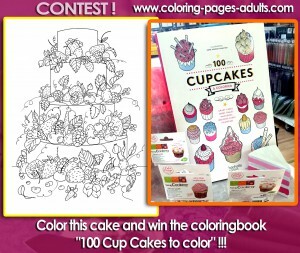 FACEBOOK CONTEST : Color this exclusive coloring page of big cake, post it in comment on Our Facebook page… and win the Coloring book”100 Cup Cakes to color” !! 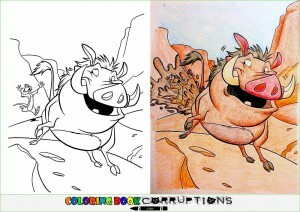 Do you know what is Coloring Book Corruption ? When funny, dark and humorous adults garble, corrupt, pervert coloring pages full of childhood characters, it often revolves around themes such as violence … ! Not surprising. 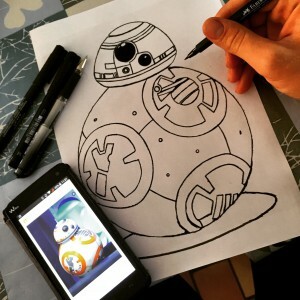 A coloring of the new Star Wars robot BB8 ! 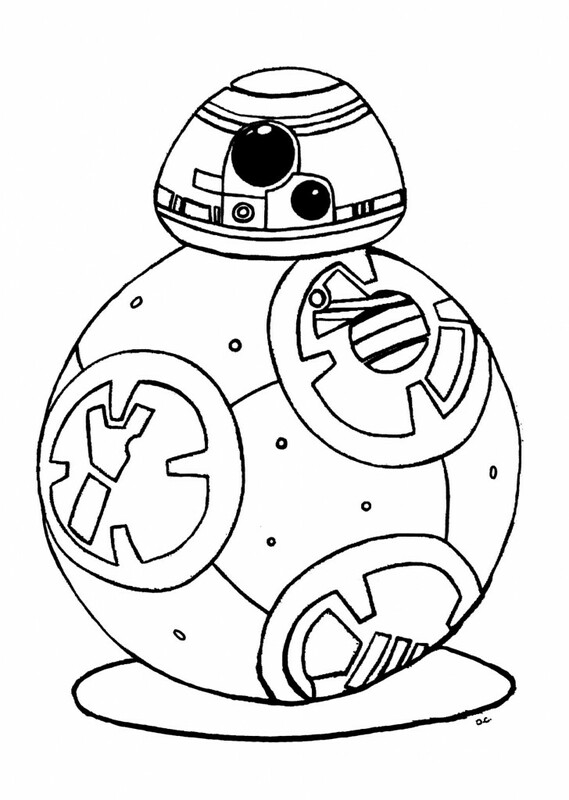 Here is a coloring of BB8 (BB-8), a new robot that will be appearing in Star Wars Episode 7, The Force awakens, to help the famous R2D2 and C3PO. So it is not an official Disney / Lucasfilm coloring, but an original work (so not necessarily perfect, thank you for your indulgence :)). Do you know that this robot really works ? 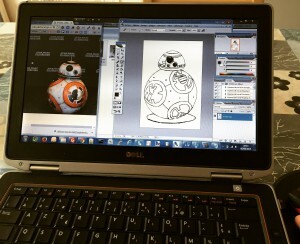 Indeed BB-8 is not a virtual character as the quickly forgotten Jar Jar Binks. Director of Star Wars The Force awekens JJ Abrams insisted that this robot was made of flesh and blood (rather metal and bolts) for several scenes of the film. 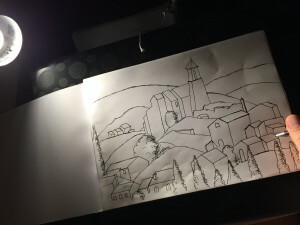 A new original coloring has been uploaded in the section “Architecture”. 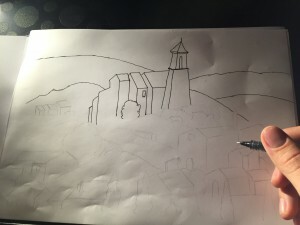 As I took pictures of my drawing at each steps, you can chose the version you want ! Just click on the picture you prefer, to download for free the file and print it. 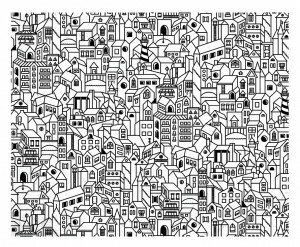 Discover 19 new coloring pages in the gallery Architecture & house ! You can also follow us on Instagram & Pinterest ! 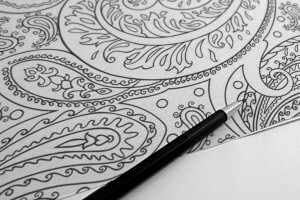 Discover the Zen Tangle with Cathy M drawings ! 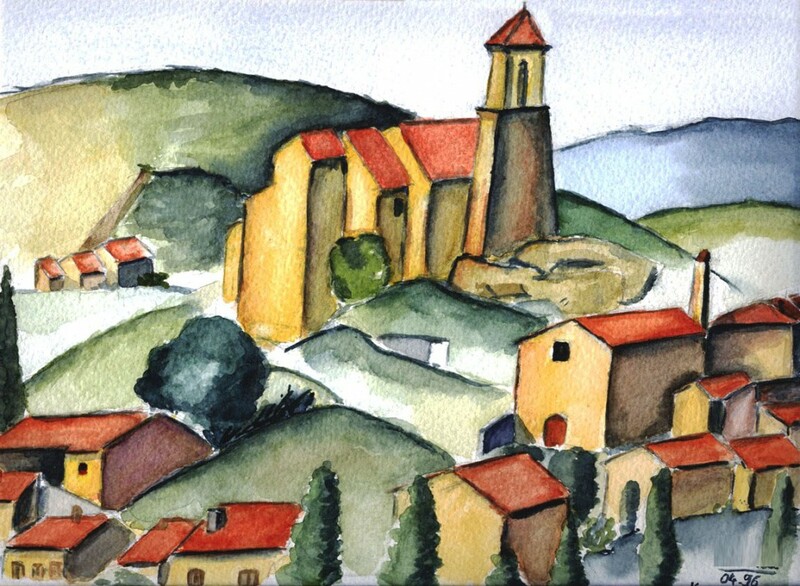 We are pleased to welcome to the site a new partner artist, this is Cathy M.
Her specialty? Zen Tangle! This is a design technique based on doodling, pretty abstract at first sight. But Cathy adds his personal touch by including messages, drawings … and the result is just unique! If you understand French, this is an interview of Cathy for the website BeauxArts.fr. 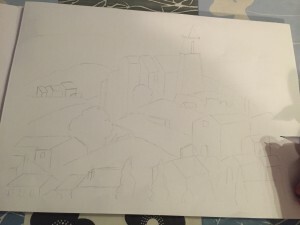 With Cathy’s agreement, we adapted his works at coloring, passing the 100% Black & White, and increasing the contrast. The coloring in question are distributed in galleries Zen & Anti-stress, Flowers & vegetation and China. 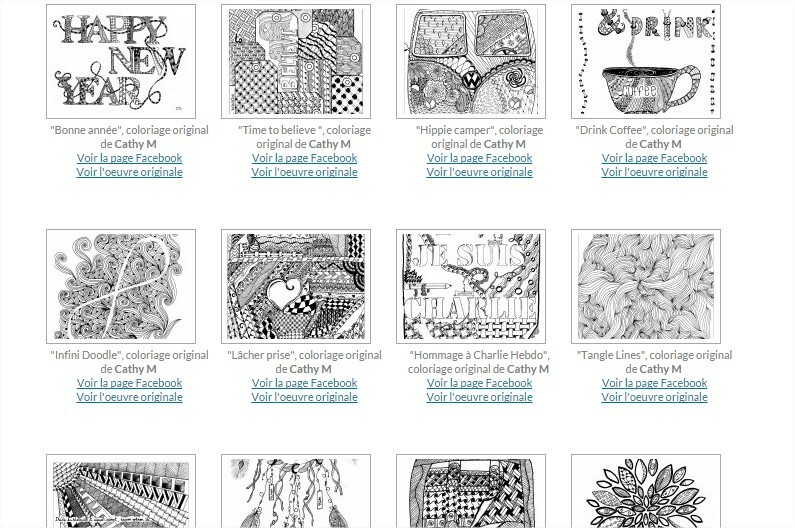 These coloring pages will please you undoubtedly, we are waiting for your comments on our Facebook page ! 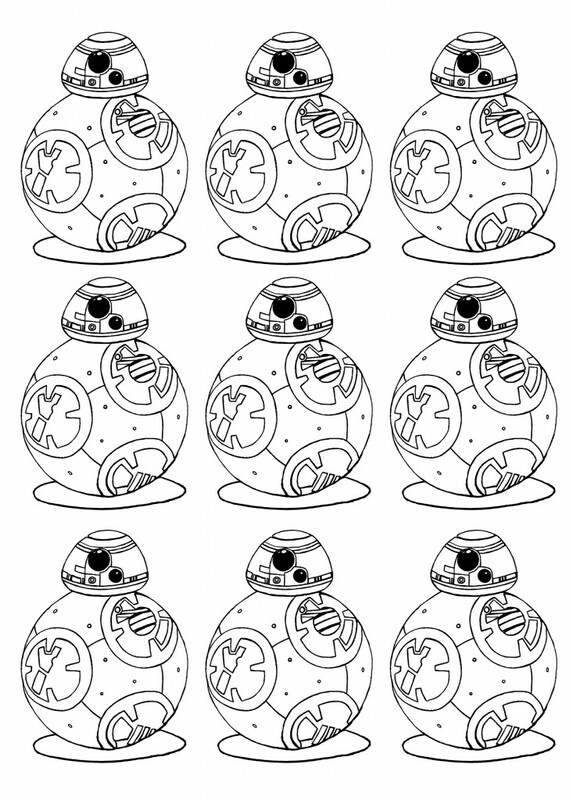 And so, go in the sections Zen & Anti-stress, Flowers & vegetation and China to download and print for free these new exclusive coloring pages ! N’hésitez pas à publier vos travaux sur notre page Facebook, nous les partagerons. 1 month ago, we launched our Pinterest page, with content of our site, contents from others pages (pin system), and Exclusive content. This is a huge sucess ! Alreader nearly 1000 followers ! 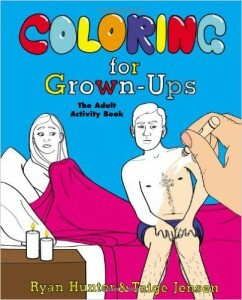 “Coloring for Grown-ups: The Adult Activity Book” by Ryan Hunter & Taige Jensen is for sure the most original coloring book for adults …. Very far from the typical coloring books (Zen, Anti-stress, animals, flowers …) these drawing represent some situations of the REAL life. The topics that you could find in the works of Ryan Hunter & Taige Jensen are : unemployment, sexual problemes, extremism, dependencies, etc … Very funny isn’t it ? It’s also a very good and original gift idea ! For adults for sure… Or people who enter in the adult age, to prepare themseleves to all the “joys” they will certain find in their future years ! 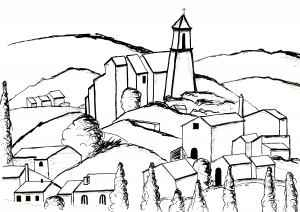 If you want more typical coloring pages, you will find it on our website, just chose the gallery you wan’t to explore. 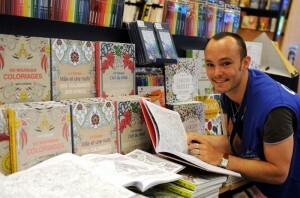 Since some years, plenty of Coloring books for adults have appeared in bookstores (virtual or real). Everyone who want to color can now buy high quality coloring books, with different difficulty levels, and various themes. These books can be purchased online or offline. Be careful, sometimes the print zone is too close from the folding of the books, so it can be difficult to color some zones… And if you wan to cut up your works, you may tear a part of it ! What are the benefits of coloring for adults ? Do you know what are the benefits of coloring for adults ? So, your mind can escape, you can forget for a instant (short or long …) your problems, little or big. 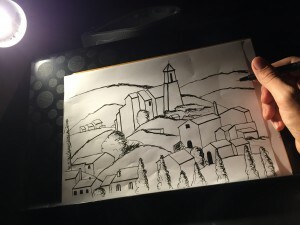 Thus, Coloring is the perfect Anti-stress & relaxing spare-time … You can be young or older, man or woman, unemployed or in professional activity … you will enjoy this activity and at the end you will be Zen ! 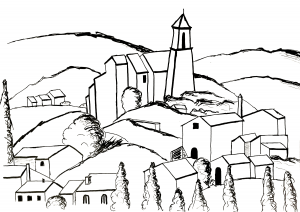 In our site, most of the galleries contain coloring pages well indicated for relaxing. 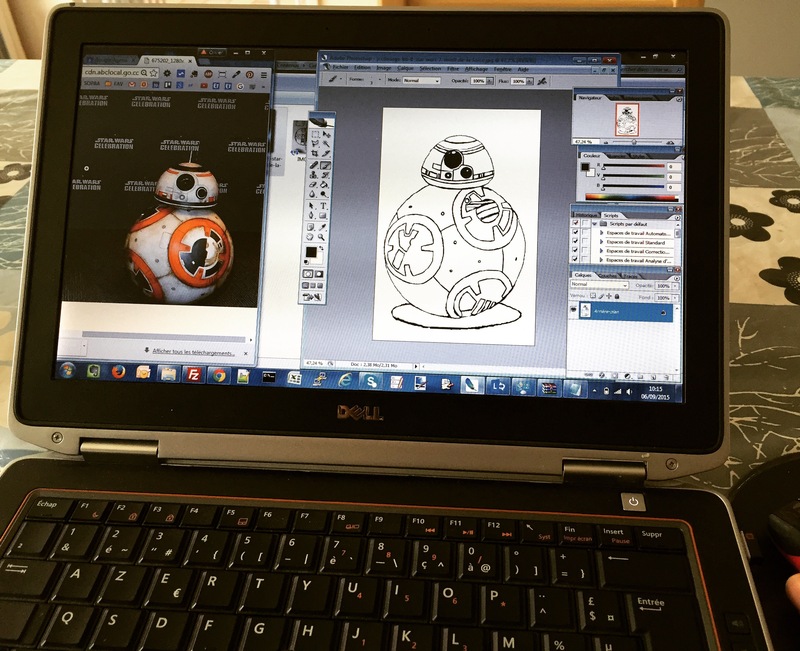 All our content is free to print or download … And we have very easy to very hard coloring pages ! 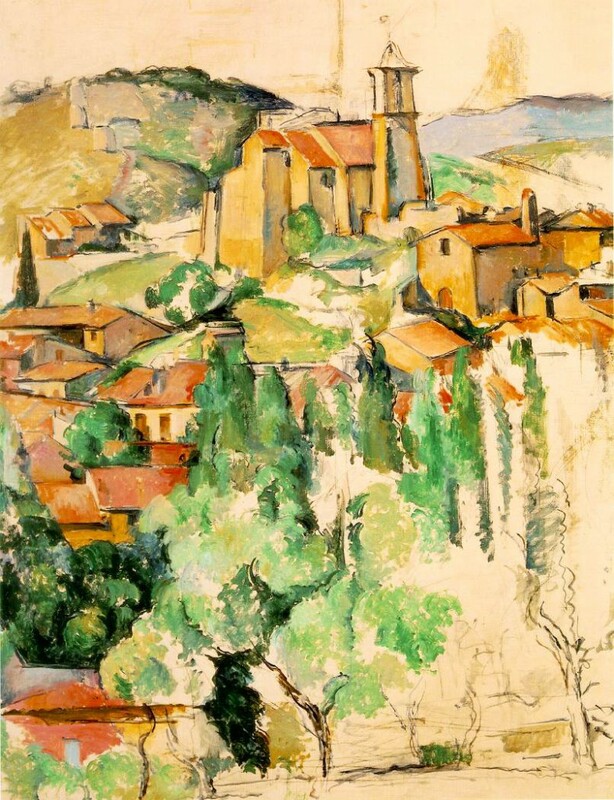 In the main page, or via the menu, you will be able to access to all the galleries. We wish you good and relaxing moments.